Wild: The existence of a creature such as Empusa discipulus is both fascinating and frightening. 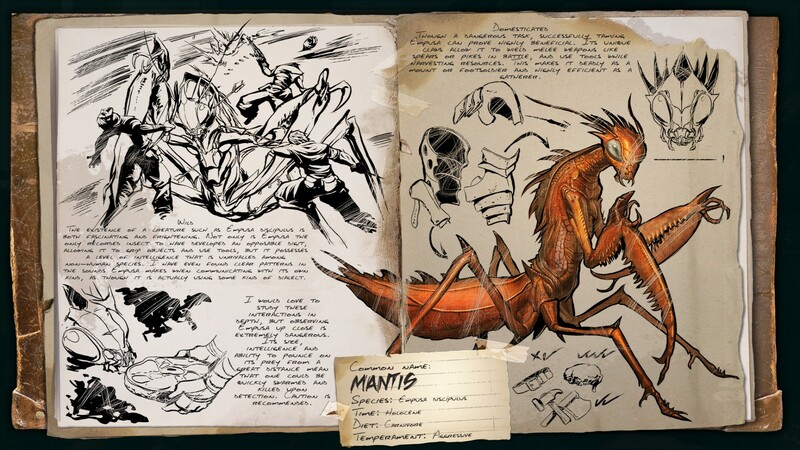 Not only does Empusa the only recorded insect to have developed an opposable digit, allowing it to grip objects and use tools, but it possesses a level of intelligence that is unrivaled among non-human species. I have even found clear patterns in the sounds Empusa makes when communicating with its own kind, as though it is actually some kind of dialect. Domesticated: Though a dangerous take, successfully taming Empusa can prove highly beneficial. Its unique claws allow it to wield melee weapons like spears or pikes in battle, and use tools while harvesting resources. This makes it deadly as a mount or footsoldier and highly efficient as a gatherer. Known Information: I would love to study these interactions in depth, but observing Empusa up close is extremely dangerous. Its size, intelligence and ability to pounce on its prey from a great distance mean that one could be quickly swarmed and killed upon detection. Caution is recommended.